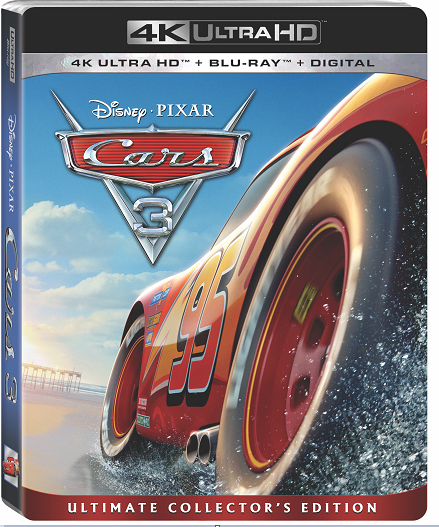 In honor of world-champion racer #95, Disney•Pixar is proud to announce the in-home arrival of Disney•Pixar’s “Cars 3” on his date-sake 9/5. Now, this summer’s high-octane hit cruises home—loaded with bonus features like the all new mini-movie starring the demolition derby legend Miss Fritter— Digitally in HD and 4K Ultra HD™ on Oct. 24, and on Blu-ray 4K Ultra HD™ and Blu-ray™ on Nov. 7. With 4K Ultra HD, viewers will feel like they’re at the center of the action—holding their breath during the dramatic crash that launches Lightning’s journey, feeling the pulse-pounding action at the Florida International Super Speedway, and getting down and dirty at the Crazy 8 demolition derby. “Cars 3” features Owen Wilson (“The Royal Tenenbaums,” upcoming “Wonder”) as the voice of Lightning McQueen. Cristela Alonzo (“The Angry Birds Movie”) voices tech-savvy trainer Cruz Ramirez, who tries to help #95 return to greatness, and Armie Hammer (“The Birth of a Nation”) lends his voice to next-gen racer Jackson Storm, whose high-tech speed leaves Lightning McQueen behind. Kerry Washington (ABC’s “Scandal,” HBO’s “Confirmation”) was called on to voice statistical analyst Natalie Certain, Nathan Fillion (ABC’s “Castle,” ABC’s “Modern Family”) provides the voice of brilliant businesscar Sterling, Lea DeLaria (Netflix’s “Orange is the New Black”) lends her voice to formidable school bus Miss Fritter, and Formula One driver Lewis Hamilton helps bring voice command assistant Hamilton to life. The third chapter of Lightning’s story pays homage to NASCAR with four characters based on real-life stock car racing legends. Chris Cooper (“Adaptation,” “American Beauty”) voices Doc Hudson’s crew chief Smokey; team owner and NASCAR racing legend Junior Johnson lends his voice to Junior “Midnight” Moon; three-time Emmy® winner Margo Martindale (FX’s “The Americans,” FX’s “Justified,” Amazon’s “Sneaky Pete”) provides the voice of Louise “Barnstormer” Nash; and Isiah Whitlock Jr. (HBO’s “The Wire,” “Cedar Rapids,” HBO’s “Veep”) is the voice of River Scott. 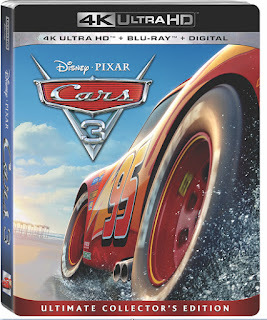 The film also features NASCAR drivers and the voices behind the sport, as well as a host of returning characters from Radiator Springs and the “Cars” racing world. Directed by Brian Fee (storyboard artist “Cars,” “Cars 2“), produced by Kevin Reher (“A Bug’s Life,” “La Luna” short) and co-produced by Andrea Warren (“LAVA” short), “Cars 3” is executive produced by John Lasseter, who directed the first two films in the franchise. With a story by Fee, Ben Queen (TV’s “Powerless”), Eyal Podell (actor “Code Black”) & Jonathon E. Stewart (“Doing Time” short), the screenplay was penned by Kiel Murray (“Cars”), Bob Peterson (“Up,” “Finding Nemo”) and Mike Rich (“Secretariat,” “The Rookie”). The film features a score by Oscar®-winning composer Randy Newman (“Toy Story 3,” “Cars”), instrumental cues composed by Brad Paisley, and original songs by ZZ Ward and Grammy® winner Dan Auerbach.